Google announced that it has started using HTTPS as a ranking signal. And that has implications for your site and whether it uses an HTTP or HTTPS protocol. For now, it’s only a very lightweight signal affecting fewer than 1 percent of global search queries, and carrying less weight than other signals (such as high-quality content) in order to give website owners time to switch to HTTPS. In this article, we will take a look at the meaning and difference between SSL and HTTPS, how to install and activate an SSL certificate and how to move WordPress from using the insecure HTTP communications protocol to HTTPS. SSL, Secure Sockets Layer, is the standard security technology for establishing an encrypted link between a web server and a browser. This link ensures that all data passed between the web server and browsers remain private and integral in order to prevent eavesdropping and tampering. HTTPS on the hand is a URI scheme which has identical syntax to the standard HTTP scheme, aside from its scheme token. However, HTTPS signals the browser to use an added encryption layer of SSL to protect the traffic. In a nutshell, SSL is the standard that defines how connections are encrypted via HTTPS. Typically an SSL certificate will contain your domain name, company name, address, city, state and country. It will also contain the expiration date of the certificate and details about the certification authority responsible for the issuance of the certificate. When a browser connects to a secure site it will retrieve the site’s SSL certificate and check that it has not expired, it has been issued by a certification authority the browser trusts, and that it is being used by the website for which it has been issued. If it fails on any one of these checks the browser will display a warning to the end-user letting them know that the site is not secured by SSL. There are lots of criteria that differentiate one from the other. In my opinion, the three listed below are the major differences between HTTP and HTTPS. URL Scheme: HTTPS URLs begin with https:// and use port 443 by default, whereas HTTP URLs begin with http:// and use port 80 by default. Security: HTTP is insecure and is subject to eavesdropping attacks, which can let attackers gain access to sensitive information of a website whilst HTTPS is designed to withstand and secure against such attacks. Network layers: HTTP operates at the highest layer of the TCP/IP model which is the Application layer. SSL security protocol operates as a lower sub-layer of the same TCP/IP model but it encrypts an HTTP message prior to transmission and decrypts it upon arrival. Thus, HTTPS is not a separate protocol, but refers to use of ordinary HTTP over an encrypted SSL connection. HTTPS is especially important over unencrypted networks (such as Wi-Fi), as anyone on the same local network can “packet sniff” and discover sensitive information. How many times have you accessed a site on an open network and got unexpected ads? When you serve your website content securely via HTTPS, you are guarantee that nobody will alter how they are received by users. If you’re serious about doing business online, you need SSL. It’s the best way to protect user data and defend against identity theft. Many customers will refuse to do business with a website that doesn’t have an SSL certificate. Displaying your SSL Site Seal tells customers they can shop or use a website with confidence, knowing they are protected. So, after you will install the WordPress for your blog, you have to setup the SSL. To make a website HTTPS, firstly get an SSL certificate for the domain, install it on the server and change the website permalinks from http to https. A lot of WordPress sites are on shared-hosting servers with cPanel provided as the control panel hence a shared-hosting will be use as the base of this tutorial. If your website is on a dedicated server or VPS, this tutorial is still applicable but the process on getting it done varies with servers. To follow along with this tutorial, ensure your shared-hosting has SSL/TLS activated. If absent, contact your host and request it. They might charge to activate it. To check if it is activated, login to cPanel and you should see an SSL/TLS manager under the Security widget. There are various kinds of SSL certificates. They are basically categorized into three groups: Domain Validation, Organization Validation and Extended Validation. Domain-level validation is the most basic type of SSL and are generally the least expensive. 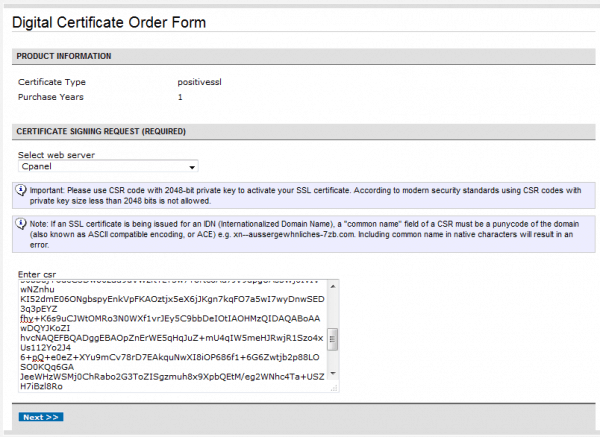 These certificates provide basic encryption, are issued very quickly and involve a simple check to verify domain ownership. Organization-validated SSL certificates include authentication of the business or organization behind the domain. This provides a higher level of security and lets customers know they can trust your server with their personal information. Extended validation is top of the line. With extended validation, the certifying authority conducts a very in-depth examination of your business before issuing the certificate. This type of SSL provides the highest degree of security and user trust. Here is a guide from Namecheap on what SSL certificate to choose. There are lots of companies selling SSL Certificates online, such as SSLs.com, Media Temple, GoDaddy, Comodo and Namecheap. Note: I bought my SSL certificate from Namecheap but the instructions remain valid regardless of the company you bought your SSL from. 1. Login to your cPanel account and navigate to the SSL/TLS Manager. 3. 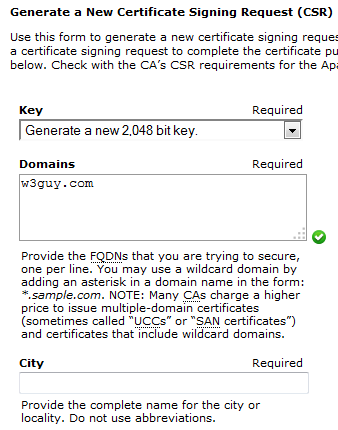 Fill out the form for the domain that you wish to create the SSL on and click the Generate button. 4. 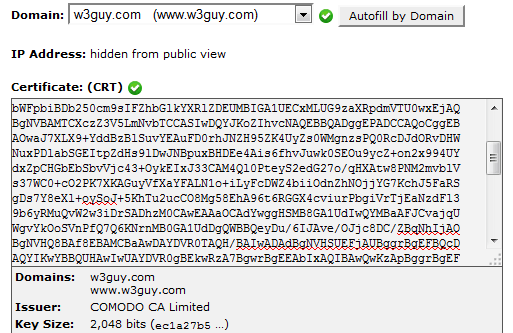 Your domain Encoded CSR should be generated and shown to you. 5. Head over to your SSL provider to get started with SSL activation. Enter the CSR code generated above in the provided CSR text area field, select the web-server your host is running on and click the Next button. 6. You will be prompted to enter your CSR information and to choose an approval email. 7. Provide your personal contact details. When done, submit the order. An approval email will be sent. Follow the instructions to validate your domain. On completion of the validation, your SSL would be issued and sent to your email. We need to get the SSL issued to you installed on your server. A dedicated IP address is required to be assigned to your cPanel account. If you cannot afford one, most cPanel hosting support Server Name Indication (SNI) – an extension to the TLS protocol that allows a server to present multiple certificates on the same IP address and port number and hence allows multiple secure (HTTPS) websites. Since the shared-hosting am using for my WordPress blog supports SNI, I decided to use it instead of buying a dedicated IP. Note: There are several advantages of using a dedicated IP address over SNI. See this article for more information. 2. 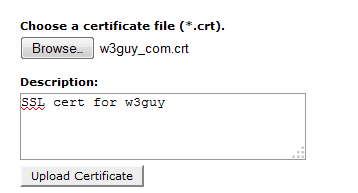 Upload the certificate (with .crt file extension) or past the certificate in the text area provided. 3. Activate the SSL for your site. Click on the link under Install and Manage SSL for your site (HTTPS). 4. Select the domain from the drop-down list, click the Autofill by domain and finally click the Install Certificate button. To change WordPress from HTTP to HTTPS, the install URL must changed from say https://designmodo.com to https://designmodo.com. Login to your WordPress dashboard and navigate to Settings > General. Ensure that the WordPress Address (URL) and Site Address (URL) are https. If not, add S after http to make https and save it. To easily enable (and enforce) WordPress administration over SSL, the constant FORCE_SSL_ADMIN should be set to true in your site’s wp-config.php file to force all logins and all admin sessions to happen over SSL. The constant FORCE_SSL_ADMIN can be set to true to force all logins and all admin sessions to happen over SSL. Now that we’ve successfully moved WordPress to HTTPS, we still need to do two more things — set up a 301 permanent redirect and inform Google of the URL change. To setup a 301 permanent redirect, FTP/SFTP to your server and add the code below at the top of WordPress’ .htaccess file. 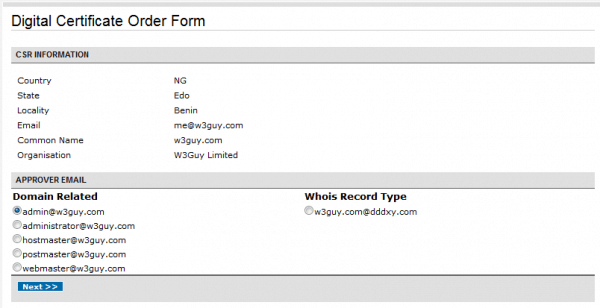 Change every instance of yoursite.com to your WordPress URL. By completing this tutorial, you should have a comprehensive knowledge on HTTPS and SSL, reasons why should make your site secure and how to set up SSL/HTTPS in WordPress. If you have any questions, suggestions or contributions, I would be happy to answer them in the comments. Thanks Tom! this works like a charm.. I did exactly the same, and it worked. But it doesn’t redirect from https:///www.mysite.com to . It says “this web site not available”. I’m at 301 redirect part, i got an error “This webpage has a redirect loop” can you help me fix this? If that didn’t work for you, use the Apache suggested code below. I have the same issue “redirect loop”. Any ideas? Hey Guys, not sure if you can help but I am getting duplicate URL’s for each page (i.e. http and https). I set up everything correctly as far as I know, I’m showing that the certificate is valid and getting the “Identity Verified” seal. All of my menu links point to https, and you wouldn’t see the http URL’s from the front end unless you manually type in an http URL manually. Which means that search engines will also see duplicate URL’s for each page. Any ideas on how to eliminate the duplicates??? Hi, you shouldn’t worry about the http links if you’ve done a 301 redirect. The 301 redirect ensures all http links get redirected to the https equivalent. As stated in the article, don’t forget to inform Google of the change in URL to avoid duplicates. All the links need to be changed sitewide otherwise the green padlock is not displayed. A mix content status is what happens when all resources are not served up securely. I am receiving “redirect loop” in Chrome after I make these changes. What can be the problem? I have followed the steps including the changes in .htaccess for Apache. I figured out the issue of “redirect loop” in my case. There was repeated redirects between http:// and https://. Once I unchecked the “Un-force HTTPS when leaving the checkout” setting, it all works fine now! Hope this helps someone else. Indeed, it resolved my problem. I was struggling it for more than a day, I was pretty sure some plugin is causing the redirect loop, but I couldn’t figure it out. Thank you very much! I followed all the directions. The site has been succesfully moved to https://. When I try to do Change of Address to move the http:// site to the https:// site under GWT, the https:// site does not appear as one of the destination options. Any ideas? I have succesfully verified the https:// site under GWT. If the https version of the site doesn’t show up in GWT, it means Google has detected that both site are the same. You need to to bother because you’ve done a 301 redirect and Google will adhere to the redirect and pass all link juice and pagerank to the https equivalent. Thank You for your response. I presume I should keep both the http:// and https:// accounts under GWT? I am assuming that going forward, no data will be collected for the http:// account and new data will begin showing up for the https:// site? Yes, you should keep both account. Over time, you will start seeing your site analytic dat on the https account. You shouldn’t get surprise when you see same data in the http version. Reason because, Google sees both the http and the https version as one. Any assistance on the side of adjusting a Multisite Network on WordPress from HTTP to HTTPS would be great as well. Thanks for a Well written and informative post..
BTW, how soon do you think google will enforce this new policy? Is there a SQL command that can delete all “http:” from all blog posts? btw thanks alot for this guide i successfully moved my wordpress site to https! Change yoursite.com to your website URL. Let me know if it work or not. I got a problem though, after installing the SSL crt and setting the URL to https, there is always a 403 error on the https sites. Any idea where the error could come from? You might want to contact your host for possible cause and solution. Have got no idea on resolving your problem. Thx for the answer though! Nice tutorial, I just want to point out that in google webmaster tool seems impossible to tell the protocol change. If I add my site with https and than I try the migration procedure the secure site isn’t listed, maybe beacuse it’s the same domain. Please go through previous comments thanks. I am currently gearing myself up to make the move to https and want to do it correctly to not lose any organic traffic. I contacted my hosting company regarding the 301 redirect rules and they recommended using the “WordPress HTTPS (SSL)” plugin instead. After the Google announced that SSL is now a ranking factor. Everyone is rushing towards moving their website to HTTPS. But most people do not realize there are many things people forget to do, like for example blocking HTTP pages from indexing and submitting HTTPS website to Google Webmaster tools again. please help me out asap!! Ensure you use the .htaccess code below and not the one in the article. If problem persists maybe a plugin is responsible. Deactivate all plugins and activate them one at a time in-order to detect the rogue plugin. Also, see previous comments for tips. WordPress checks the value of FORCE_SSL_ADMIN and calls the function is-ssl in wp-includes/functions.php in order to redirect to https or not. I keep ending up with an F (0 for key exchange)??? And also “This server supports anonymous (insecure) suites” so I am capped at a B anyway. I don’t want to press for a clearer understanding or else they will just ignore my emails! As requested by another user, does anyone know the steps to enable HTTPS on a Multisite Network instance of WordPress? 1) Thanks to TLS-SNI HTTPS servers don’t need dedicated IP addresses anymore. 2) That increase is negligible, due to hardware implementations of crypto algorithms in modern CPUs. 3) Valid point, although it’s not a new problem. If you forget to regularly patch your servers, a hacker will take down your site too. Also, a major benefit of using encryption everywhere is that it increases “background noise”, making encrypted transmissions less suspicious. WordPress ludicrously stores a lot of its URL references in the DB with absolute URLs (this is horribly, horribly painful and hits you even moving the site from dev to UAT to live), so your DB will still be full of http:// references even with the Apache rewrite rules that are suggested. If you “View Source” on your pages, you really should have *nothing* that is sourcing http:// URLs – this includes both internal ones for images/CSS/JS and external ones (e.g. Google Web fonts, JQuery and other such external services). Make sure you set your max_execution_time high (e.g. 600 seconds) in php.ini if you have a large DB. To fix external http:// URL references, change their URL start from http:// to just // (two slashes mean “load in the same protocol that the page was loaded in). This “fools” WordPress’ is_ssl() core function that the page was loaded in SSL. Thanks so much for pointing this out. Seems like a major step that was missed. I began the switch from HTTP to HTTPS today (wordpress site) and ran into the problem of Chrome and Firefox not loading my site properly. I emailed the interconnectit company asking for their help with the plugin so I don’t mess anything up. I guess if I don’t hear back from them I might go for it since I backed up my site. Is this how you would do it? REPLACE http://yoursite. com WITH https://yoursite. com ? Or is it more complicated than that? Thanks again! I got redirect loop using this htaccess :(. any idea? Hey guys, Thanks for the helpful article. Unfortunately there’s still an issue on my side. On a related note – my site has ‘non-www’ as the preferred variant. I noticed that when I used the full URL including ‘www’ it didn’t work, but when I used the full URL without the ‘www’ it did work. another reason to change to HTTPS It’s because HTTP/2 protocol need both SSL cert and HTTPS 443 port. Which is much faster that traditional protocol HTTP/1.1. And http/2 is now getting more and more browser support. plz help i can’t open my site. When i search my site vareyn.com on google search the first link to my site when i click to link. my site go to “https ssl” but i don’t want to it. I followed your tutorial – updated the .htaccess file and now I get an error on the site that says I have too many redirects. I just finished moving from HTTP to HTTPS and I was able to do this successfully. However, I have been getting the “this page is not authorized….” notification sign whenever I visit on a browser. How do correct that please?? I recently did a http > https redirect on my site. However, this only seems to have worked for the home page, my posts can still be accessed through http. Is this normal? If so, to eliminate all http urls, must i place a redirect on each of them? thanks for this article, worked for me although I also changed “redirect” code for htacces file. In that case do I still need to insert the code in config. and .htaccess files or after updating the general settings page url to https it will be ok ? Our ISP installed SSL certificate by Permalink Settings on wordpress backend keeps on moving to HTTP instead of HTTPS. What could be the problem?